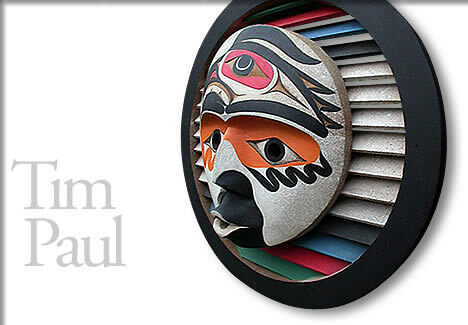 Tim Paul belongs to the Hesquiat Tribe, which is located about 50 miles northwest of Tofino. He was born in 1950 at Esperanza Inlet on the West Coast of Vancouver Island. He learned to paint at the age of ten, encouraged and inspired by his family. Tim later went to work at the Royal British Columbia Museum where he eventually became head carver. Tim Paul has created numerous important works, including a Nuu Chah Nulth pole given by the People of British Columbia to the city of Auckland in celebration of the 1990 Commonwealth Games. Tim received a great deal of teachings from the Nuu Chah Nulth elders, which he uses whenever he produces his carvings. His carvings are the definite link to his past and will live on for years to come.